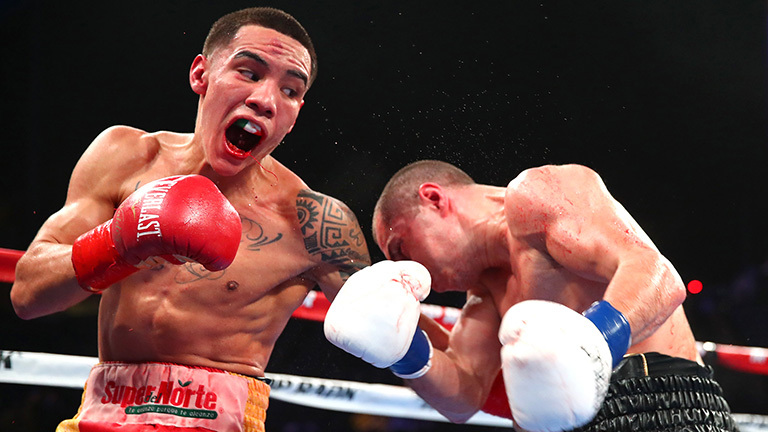 WBO featherweight champion Oscar Valdez 24-0 (19) returns to the ring on Saturday night when he takes on Italy’s Carmine Tommasone 19-0 (5) on the undercard of Eleider Alvarez versus Sergey Kovalev from the Ford Center at The Star in Frisco, Texas live on ESPN. The 28-year-old Mexican suffered a broken jaw at the hands of an overweight Scott Quigg in Los Angeles last March. In the intervening 11-months Valdez has been rebuilding both his body and his team, installing Eddy Reynoso as head coach. “It is a new chapter in my life, I had to keep going forward, I had to adjust my technique, I have to make adjustments in my boxing style, do everything necessary in order to keep marching forward,” said Valdez to Fightnews. “I have to work hard, not just working extra hard but the key is to work smart, with technique, with a plan, strategy inside and outside of the ring and that’s what we are doing with Eddy Reynoso. I’m studying my masters degree and if I had to put a label on Eddy he would be Harvard, right now I’m studying at Harvard. “Eddy is a formidable trainer, he is an all-around teacher, he has had Canelo Álvarez from the beginning of his career and not only Canelo but several other world champions. He has dedicated me his time, the time that a fighter needs to be ready and prepared for battle.